Purchase this book now through the publisher Kensington Books or at amazon.com, barnesandnoble.com, booksamillion.com,indiebound.org, or your favorite retailer. Do all dogs and cats really go to heaven? Yes, they do! The death of your beloved pet can be one of the most heartbreaking losses you’ll ever endure. But recovery isn’t only about closure. You also want to know where your best friend has gone. After the intense, unexpected grief he experienced following the loss of his own companions, animal lover and biblical scholar Gary Kurz set out to prove that there are indeed pets in Paradise. After devoting countless hours of research, he now shares his inspiring insights to bring you a richer understanding of animals and their souls. You’ll finally find answers to common questions about animals and the afterlife—and you’ll also get a 30-day devotional to help you work through your grief. 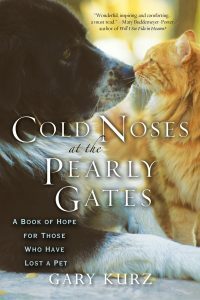 If you’ve ever loved and lost a pet, or if you know someone who has shared a special bond with a furry face and a cold, wet nose, you’ll welcome this amazing book’s reassurance that love and loyalty are truly eternal, and that someday, you and your pets will be together again.